Everyone loves soup, and during winters, a warm bowl of delicious soup with family and friends can make your day just perfect. Have you ever tried preparing soup in a pressure cooker? It will not only help you save time, but the result will also be much tastier. 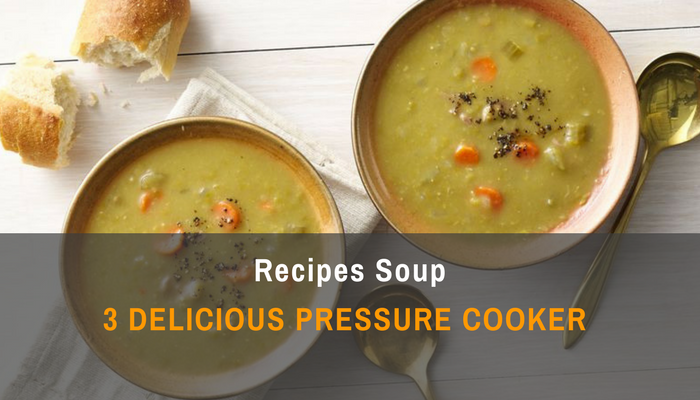 Below are given three amazing pressure cooker recipes for soup, which you can prepare, and win the heart and praises of your dear ones. This is a simple recipe for a delicious yet nutritious soup. It will be best if you use homemade broth for this recipe. However, if that is not possible, buy the carton packed broth and not the canned ones. Add olive oil in your pressure cooker, sauté garlic and onions in it, until onions become translucent. Add celery, carrots, and sauté for about 2 minutes. Add ground cumin and stir properly. Add lentils, vegetable broth, bay leaves, and close the pressure cooker. Bring up to pressure and cook for 20 minutes. Allow the pressure to come down itself, and then open the lid. If you want, stir in the spinach leaves, and remove the bay leaves. Add salt and pepper to taste. Your soup is ready to serve. This is one of the easiest yet extremely delicious quick Mexican soup recipes. Heat the oil in the pressure cooker, and sauté garlic and onion in it, until soft. Add stock, tomato sauce, carrots and bring to boil. Combine rice, egg, meat, and spices in a bowl, mix well and form small meatballs. Add the prepared meatballs into the boiling stock. Seal the cooker, and bring up to high pressure. Quick release the pressure, or let the pressure release naturally. Sprinkle a little grated pepper jack cheese and serve. This is a filling soup, which tastes great, and is very easy to make. Chop the onions and carrots finely. Put each of the ingredients in the pressure cooker. Bring the cooker to pressure, reduce heat, and let the soup cook for another 20 minutes. Let the pressure reduce naturally. Allow the soup to stay for at least 1 hour, then reheat and serve. It tastes much better when served this way.